Well... I done pulled the trigger on a new TX finally. I love my fs-i6x and I'm still planning on my mod combo, but I've been wanting a jumper for a long time now. Mainly just for the additional mixes, plus the price was right at 66 usd to the door. I didn't get the Plus version, but if I really want the hall gimbals I can buy them later and still be cheaper than a Plus new. Should be here Monday so I'll have more to say about it then. Have a great weekend! I really like my jumper radios. I think you will too. I especially like the ability to view/update model files on a computer - sometimes setting up everything manually on the radio is tedius, and it's much easier to copy bits and pieces from other model files. There is an app called Model file manager that I found no the deviation forums that makes it easy to back up and view the files. My T12 has been great. 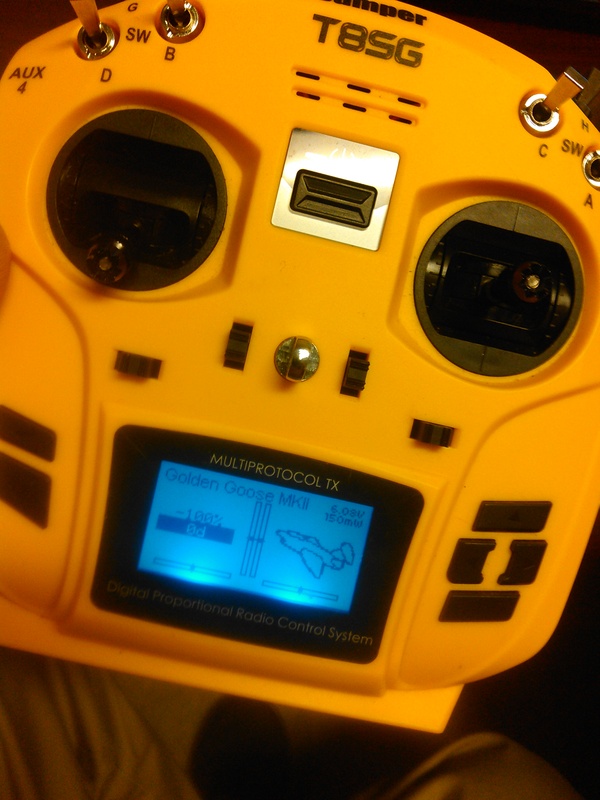 The multi protocol module is pretty good, mine has bound to Horizon Hobby, Lemon, Flysky and FRsky D16 without any issues. It hasn’t worked with my Eachine 010 because they have changed the board crystals. Thanks for the encouragement, I've been watching these TX's for what seems like a year now. I did a lot of research on the deviation, and like you said joelspangler, I'm really looking forward to the PC functionality. And again, don't get me wrong, I LOVE my i6x, but I do wish there was more firmware development. Maybe one day soon. And I do have something to admit, I've been putting off my mods for the i6x because I can't stand the feeling of not having a radio ready. The jumper will become my primary while I get the batteries and irx4 installed. I have the T8SV V2 plus and love it, finding Devation easier to use than OpenTX. The Hall-Effect gimbals are non contact, using a magnets and sensors to measure the stick movements rather than a variable resistor. Advantages are very smooth movement, very repeatable measurement of stick movement and no wear unlike using a variable resistor. I was afraid you were going to say that CarolineTyler! If I hadn't scored this TX at such a good price, I would have gone for a new Plus model. Amazon has the hall gimbals for 20 usd free shipping, so even if I do the conversion I'll be about 20-30 bucks under a new one. Of course, I don't get the big screen, but I can live with that. Be aware there’s some slightly tricky programming required to get the Sport CubS Safe mode all working with non Spektrum TX’s. I have all the settings down for the Jumper T12 on OpenTX but not for Deviation which is on the T8, check the Deviation forums for guidance on setting up Safe. From memory channel 5 is safe, intermediate then advanced, on a 3 position switch, then channel 6 is “panic” mode on a momentary or single position switch. I now have my eye on a T16 - shame they don't have the silky smooth hall effect gimbals and of course I will then have to dive into the OpenTX (OpenJumper) pool!! Me too! And I actually would have been more apt to purchase if there was a US based seller. I'm curious how the double ball bearing adjustable gimbals compare to the hall effects. Maybe by the time my birthday rolls around I can spoil myself lol. Let us know if you pull the trigger and get one! Well I blame my lack of production last night on this new TX. Was up to the wee hours pouring over the menu (after menu after menu). I must say I'm already in love with it and I haven't even hooked it up to my pc yet. Takes some getting used to the flow on the menu, and there plenty of settings I'm not clear on yet (channel direction). Looks like it's time to get my reading glasses out! My take so far... The layout is obviously small form factor. I don't particularly have large hands, but I don't have sausage fingers either. It's very comfortable for me, but I've never used a standard form factor TX. I love the case it came with and the fact that the battery is VERY simple to convert to lipo/lion (balance plug connection). The screen is small, but very easy to read (even for blind old men). I did get this used so there are some scuffs on the screen I need to try and buff out. The antenna is on the small side but at least it's removable and fits the size of the TX very well. The side rotary knobs are awesome (I really hate the placement of the rotaries on the fs-i6x) and I'm still figuring out what I'm gonna do with 4, 3 position switches lol. There's a mod box on the back and the usb and 3.5 are on the very top. The trim buttons are tall and crisp and easy to find with eyes off. 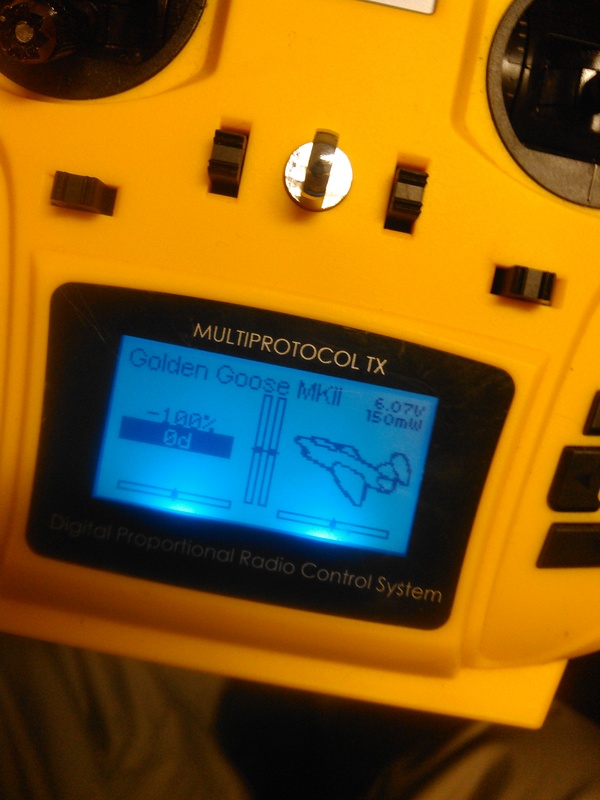 My first setup will obviously be the Goose. I'm adding a few more servos to her setup and I've got some various mixes in mind (details after fruition) but my first mix/feature to tackle will be a true throttle lock that works on diff thrust. Them 10" finger snappers/ear trimmers are spooky when you accidently bump the rudder lol.